With SharePoint Server 2019 recently released and the continued development of SharePoint Online in Office 365, SharePoint is always changing. While it may look and function differently for different organizations, it remains the backbone for business documents across the world—whether files reside in SharePoint Server, SharePoint Online, or in OneDrive, or Microsoft Teams in Office 365. Along with SharePoint, what it means to be a SharePoint Influencer is also changing. In 2018, being a SharePoint Influencer goes beyond solely the SharePoint platform. SharePoint leaders are also Office 365 leaders, as they help businesses move to the Office 365 cloud. As such, our annual Top 25 SharePoint Influencers in Europe list for 2018 recognizes and celebrates SharePoint experts who are helping organizations make the leap to the cloud. There are many SharePoint experts in the Microsoft Partner Network, but it takes much more than expertise to be a top Influencer. The Top 25 SharePoint Influencers in Europe list ranks SharePoint experts based on a quantitative ‘influence’ score that combined engagement and follower base on social sites, blog reach and frequency, depth of topic coverage, citations from other influential bloggers, and feedback from the SharePoint user community. European SharePoint and Office 365 experts are gathering between November 26 and 29 at the European SharePoint, Office 365 & Azure Conference (ESPC) in Copenhagen. 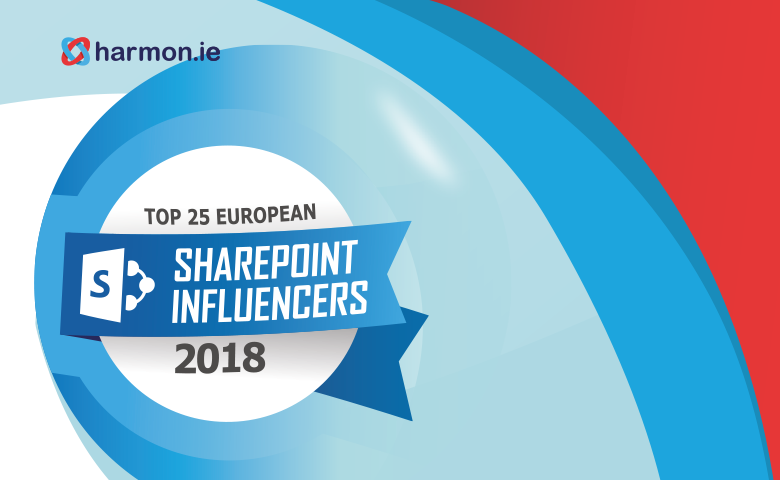 The Top 25 SharePoint Influencers in Europe will be joining us on November 27 on the harmon.ie stand (#2) to celebrate. Be sure to join us if you’re at the event. A huge congratulations to the Top 25, and all those that continue to help businesses capitalize on SharePoint, both on-premises and in the cloud. Make sure to look out for harmon.ie at ESPC. View our other events here.